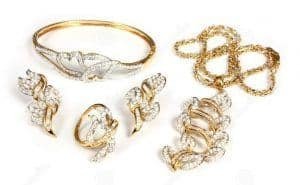 Cash Pawn Loans for Estate Jewelry at Alma School Pawn! It’s never been easier to pawn your estate jewelry in Mesa, Arizona than it is right now at our conveniently located pawn shop store in the eastern suburbs of Phoenix, Arizona. Our central location allows us to extend our service to everyone in the nearby communities of Chandler, Gilbert, Scottsdale, Tempe, and Apache Junction as well, so if you live anywhere in the surrounding region, we strongly encourage you to bring your estate jewelry in for a fair and accurate appraisal. Even old vintage pieces can still retain significant value, especially if they are set with gemstones, or are mounted in settings that include precious metals. The only way for you to find out for sure what kind of value your estate jewelry might have, is to allow our our expert in-house jeweler evaluate it for you, and have it converted into the cash you need, right on the spot, while you observe the whole process. If you don’t really wish to sell your estate jewelry, but prefer to keep it in the family instead, you can pawn your estate jewelry in Mesa, Arizona very quickly, and while you receive the immediate cash you need, you’ll also be able to resume ownership of your valuable jewelry items after you pay off your loan agreement fully with us. Pawn loan agreements are set up to cover a period of 90 days, and each month your monthly installment would include an amount comprised of both interest and principle, so as long as you at least pay the interest every month, your account will remain valid and in good standing with us. The sooner you can pay down the principle part of the loan, the better it will be for you of course, because you will be reducing your outstanding balance toward completion of the agreement. Gold, Silver, and Platinum Jewelry is All Accepted! We can accept a very wide variety of jewelry in your estate collection, and we’re especially interested in diamonds, watches, rings, bracelets, pendants, gemstones, earrings, designer jewelry, and all kinds of precious metals such as gold, silver and platinum. In the case of precious metals, our expert jeweler will consult the New York spot market for the current fair value of any gold, silver, or platinum that you bring us, because our goal is to be as fair and accurate as possible in issuing payouts for your estate jewelry. When you pawn your individual jewelry items or entire collections with us, you can rest assured that every piece will be stored safely and securely on the premises, in anticipation of the day when your pawn loan agreement has been fully paid off, and you can resume ownership of your valuables. At that time, you will be eligible to initiate another pawn loan agreement with us, so if you have other items having value around your household, you may bring those in to our store as well. We like to encourage customer loyalty among our patrons, and we do everything we can to make our store your one-stop shop for pawning valuable items in your possession.